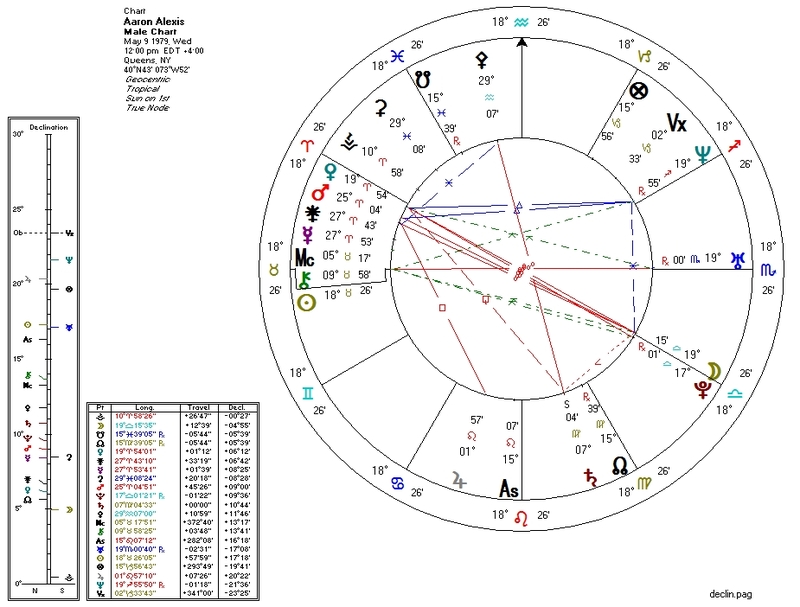 The astrological charts of criminals share features common to the charts of persons who support authoritarian political systems. In addition, the charts of politicians who promote the initiation of war resemble the charts of mass-murderers. This confirms through astrology what libertarians already know: the willingness to subject one person to the control of another is immoral. Corollary: warmongers are mass-murderers with the sanction of the public. 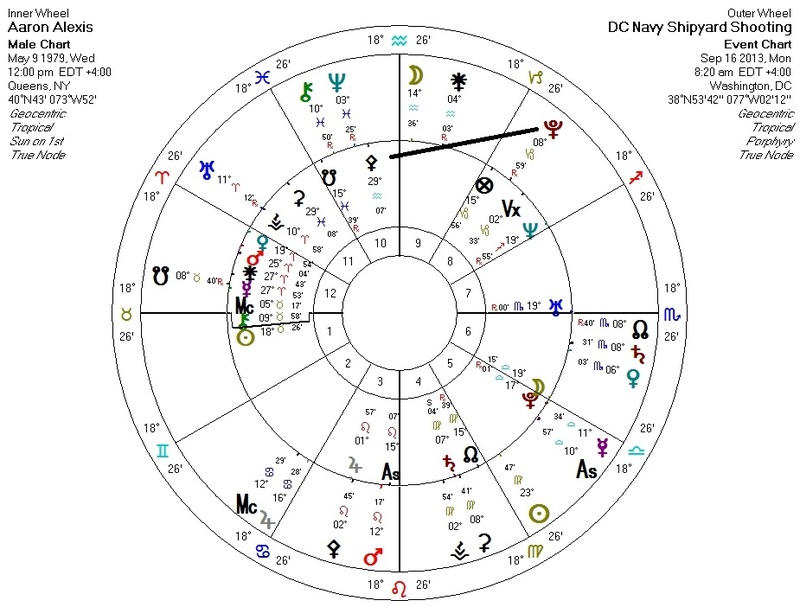 It is no surprise that Navy Yard shooting perpetrator Aaron Alexis' chart holds the Bloodbath Formula shared by fellow mass-murderer Barack Obama, among many others. The essential difference between these two killers is that one is dead, and the other will use this incident to empower other killers (by enacting victim-disarmament laws so that future Aaron Alexises will have more defenseless targets to kill). Alexis' killing career is over. Obama's has three more years. 1. Pallas is not entirely bad on this chart: she is sextile Mercury, quindecile the North Node, and co-ruled by Saturn which is widely conjunct the North Node. It's not enough, apparently: Pluto is widely sesquiquadrate Pallas and semisquare her co-ruler Saturn. Uranus, the other Pallas co-ruler, is trine the South Node. 2. Neptune is trine Venus (though Venus is parallel the North Node, oddly echoing the chart of the shooting). 3. Pluto is opposite Venus. 4. Pluto is conjunct the Moon. 5. Pluto is quincunx the Sun. As noted before, transiting Pluto against natal or progressed Pallas triggers a crisis of ethics in the native. If the native is already predisposed toward violence, we often get violence. Yesterday's shooting is no exception, with transiting Pluto forming a septile against Alexis' Pallas, echoing the Sun-Pallas septile recently formed in the sky. Pallas rules the libertarian non-aggression principle. When Pallas or her sign ruler are blocked by a hard aspect with Jupiter, modified by any aspect with Pluto, and/or weakened by the South Node, tyranny and violence often follow. P.S. : Most of today's mass-shooters are on FDA-approved psychiatric drugs when they rampage. Alexis is apparently not an exception. If the Powers-That-Be were truly interested in ending these events, they would enact not "gun control" but "medication control".